The latest customer satisfaction rankings from J.D. 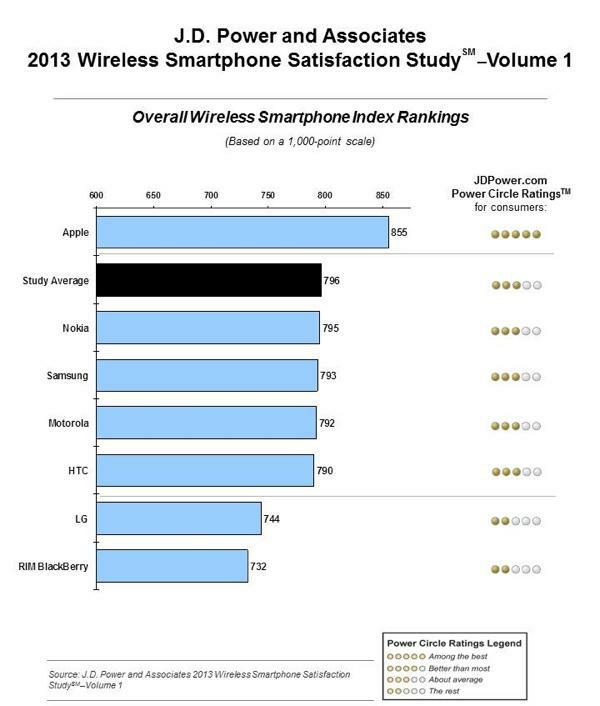 Power and Associates show that once again Apple is the top company for customer support in the smartphone industry. Thursday's result marks the ninth straight time that Apple has taken first place. Apple earned a score of 855 out of a possible 1,000 in the Smartphone Index Rankings. The iPhone maker's score was so high that every competing smartphone maker actually had a score below the study average. Skewed by Apple, the study had an average score of 796, which was one point better than second-place manufacturer Nokia. Nokia's lead over its rivals is also slim, with Samsung, Motorola and HTC each earning respective scores of 793, 792 and 790. From there, the scores drop off a bit more, as LG came in sixth with 744, and BlackBerry took last in the poll with a score of 732. Apple was the only company among all smartphone makers to earn five "Power Circles" in the study. Nokia, Samsung, Motorola and HTC each earned three, while LG and BlackBerry took two. "As the capabilities of wireless phones and their applications continue to expand, and as customers grow more reliant on their device, handset manufacturers have an opportunity to further shape the customer experience and impact satisfaction with better integration of services and more communication options, such as video chat," said Kirk Parsons, senior director of telecommunications services at J.D. Power and Associates. "It is important, however, that manufacturers meet the expectations of those customers who take advantage of such offers by ensuring the features are intuitive and, ultimately, rewarding to them. Providing an easy-to-use, yet powerful operating system with the ability to customize applications to suit individual needs is essential to providing a high-quality and rewarding wireless experience."